The portion of the United States that I am originally from, and that state in particular along with a neighboring state with the same “first name,” is known often for producing people who are verbally rude and aggressive. There is more than an ounce of truth to this impression. Yet, at the same time, I have come to appreciate some elements of the candor and open communication of the “New” places. There is little ambiguity as to where you stand with someone, and little room for misunderstanding and wrong impressions. When an appropriate addition of Christian love that seeks the well-being of another person accompanies the forthright speech, great good can come from it. The Apostle Paul was a person of blunt conversation, that is for sure. He did not stutter about what he was saying to this or that person, group or church community. He confronted Peter to his face, and he had a sharp disagreement with Barnabas that ended with them parting ways in ministry. And many portions of his letters come right out with bold rebukes and exhortations. But at the same time, his genuine love and high desire to see the recipients prosper in God’s grace was undeniable. None of the churches had quite the same punches to the nose and pokes in the eye from Paul as did the Corinthians. None of them deserved it more. But none of them had as many bold proclamations of his genuine affection for them. That Paul didn’t just give up on them was evidentiary point #1 of his deep love for the church in Corinth. 2 Corinthians 6:11 – We have spoken freely to you, Corinthians, and opened wide our hearts to you. 12 We are not withholding our affection from you, but you are withholding yours from us. 13 As a fair exchange—I speak as to my children—open wide your hearts also. This passage beginning with verse 14 is most often used to speak to the issue of mixed marriages of a believer with an unbeliever. Though that may be a fair application, Paul is in this context most likely speaking about his desire to see the Corinthians “divorce” their relationship with false teachers who had come into the community – these dangerous folks being from the idolatrous world of that place, or more likely those who were not genuinely connected to the true gospel message. In any event, they were not believers; they were impostors and a grave danger to the health of the church. This could not continue, and there simply had to be a total break from them. Five questions list five incongruous elements. The word “Belial” was a Greek transliteration of a Hebrew term that spoke of a “worthless person” … often used to refer to Satan. Three Old Testament quotes are given by Paul. These looked back to times where God exhorted his chosen people to eschew idolatry and the dirty ways of false religions and to commit fully to God as their Lord and Father. The Corinthians needed to do the same. Though we cannot isolate ourselves from the dark world around us, we do need to clearly understand what is light and what is darkness. We need to choose to maximize our relationships with one another, with the consequence being a greater light that shines into the grave darkness. It is necessary to clearly understand truth so as to not compromise it by admixtures with the errors of the natural world. One of the surprising and somewhat depressing observations of my life is to look back on the many dozens and dozens of guys whom I knew well in college and seminary. Though upon entrance to each institution, pretty much everyone was committed to a lifetime of ministry, honestly the percentage of those who have actually done it is sadly rather small. The education at both schools was very intense as well as very excellent. It was difficult to complete. It therefore startles me that so many went through all this academic preparation, only to use it in vocational ministry for a very small time of life or in a very fractional way relative to other pursuits. Paul just finished speaking of being compelled (or pressed hard) by Christ’s love to prioritize the gospel message in all of life. If one really believes this but then does not act upon it, this is receiving this message of grace in vain … as he says in 6:1 – As God’s co-workers we urge you not to receive God’s grace in vain. The word for “vain” has the meaning of being “empty.” Not living for the proclamation of the gospel, having received it, was really a waste of time. And Paul says, in the spirit of Larry the Cable Guy, the time has come to Git-R-Done! … 2 For he says, “In the time of my favor I heard you, and in the day of salvation I helped you.” [from Isaiah 49:8] I tell you, now is the time of God’s favor, now is the day of salvation. After years of expectation and hope, the Messiah Christ has come and given his life as a payment for sin, and not just for Israel, but for all people. This is a message to spread. 8 through glory and dishonor, bad report and good report; genuine, yet regarded as impostors; 9 known, yet regarded as unknown; dying, and yet we live on; beaten, and yet not killed; 10 sorrowful, yet always rejoicing; poor, yet making many rich; having nothing, and yet possessing everything. Living for Christ and preaching the gospel out of a response to the great love that Christ has shown us is always going to be difficult. Though there are blessings along the way, great trials are inevitable. But even in the sorrows and depredations there is a God-given sense of joy, satisfaction and fulfillment. If we calibrate our expectations toward a realism about the nature of a sinful world, our difficulties in living for Christ take on a new dimension. We become eternity-minded in light of the bigger picture of God’s work. Chief Executive Officer of a Fortune 500 company? A leading member of Congress? A pop star with 17 million followers on Twitter? Manager of the Baltimore Orioles or head coach of the Dallas Cowboys? An ambassador of the King of Kings and Lord of Lords. You selected number “4”? Logical, but wrong. The correct answer is “5.” And that is what you are if you are a redeemed sinner-turned-saint through the blood of Jesus Christ. 2 Corinthians 5:11 – Since, then, we know what it is to fear the Lord, we try to persuade others. What we are is plain to God, and I hope it is also plain to your conscience. 12 We are not trying to commend ourselves to you again, but are giving you an opportunity to take pride in us, so that you can answer those who take pride in what is seen rather than in what is in the heart. 13 If we are “out of our mind,” as some say, it is for God; if we are in our right mind, it is for you. Paul said that his motivation was directed toward the Corinthians for their eternal well-being, however poorly they might interpret it. The message that came to Paul on that Damascus Road changed everything about his life and motivation. His life had a new purpose and drive. I’ve gotten a bit of a feeling that some folks are wearying of my Greek word references. Sorry … just trying to make passages come alive a bit more. But do this … look back at those verses 14 and 15 and think about what word – if better defined with all the color of its usage in the original language – would most make these verses jump out even more? I think it is rather clearly the verb “compels.” What did Paul mean when he chose this word, and how might the original readers have understood it? The word means in a more literal sense to “press tightly” … like to squeeze something together. This word was used in Luke 8:45 to describe the throngs of people who were around Jesus and pressing tightly against him – in that moment when the woman who needed healing exhibited her great faith by somehow reaching through the “press” to merely touch the hem of his garment. So Paul was saying he felt the squeeze to live life in an intentionally bold way of high-level motivation and action. In fact, Paul no longer just had simple, worldly categories of seeing people as, say, being rich or poor, important or mundane, slave or free. No, rather he saw them in one of two categories: stuck in the old category of lost in sin in a lost world controlled by the Evil One, or a totally new creation in Christ. 16 So from now on we regard no one from a worldly point of view. Though we once regarded Christ in this way, we do so no longer. 17 Therefore, if anyone is in Christ, the new creation has come: The old has gone, the new is here! 18 All this is from God, who reconciled us to himself through Christ and gave us the ministry of reconciliation: 19 that God was reconciling the world to himself in Christ, not counting people’s sins against them. And he has committed to us the message of reconciliation. 20 We are therefore Christ’s ambassadors, as though God were making his appeal through us. We implore you on Christ’s behalf: Be reconciled to God. 21 God made him who had no sin to be sin for us, so that in him we might become the righteousness of God. So, don’t you feel better about yourself right now? Hope so. And oh, that means you’ve got work to do that counts for eternity, doing that work today, tomorrow, and every other day until the end. You can stop reading now and go be an ambassador in your world. Most of us do not live daily with fear of mortality. However, some who live with life-threatening medical conditions would differ from the majority. I think also of several of our missionaries in more remote and hostile conditions. They may not always know what dangers could be lurking nearby. 2 Corinthians 4:16-18 – Therefore we do not lose heart. Though outwardly we are wasting away, yet inwardly we are being renewed day by day. For our light and momentary troubles are achieving for us an eternal glory that far outweighs them all. So we fix our eyes not on what is seen, but on what is unseen, since what is seen is temporary, but what is unseen is eternal. Paul is speaking of the wasting away of the human body. If you haven’t had this experience yet, thrust me, believe me, it’s coming! It is a startling thing to realize that you simply can no longer do something that was a regular event of your earlier life (like running from filming a kids scene at the ark out back and into the church where the main group was rehearsing, only to have knees ache and sciatic nerve feedback for days afterward!). And Paul says that these momentary troubles cause us to have a perspective that helps us to let go of this visible, physical world and to rather cast our vision above to the permanent world that is yet to come. 2 Corinthians 5:1 – For we know that if the earthly tent we live in is destroyed, we have a building from God, an eternal house in heaven, not built by human hands. 2 Meanwhile we groan, longing to be clothed instead with our heavenly dwelling, 3 because when we are clothed, we will not be found naked. 4 For while we are in this tent, we groan and are burdened, because we do not wish to be unclothed but to be clothed instead with our heavenly dwelling, so that what is mortal may be swallowed up by life. 5 Now the one who has fashioned us for this very purpose is God, who has given us the Spirit as a deposit, guaranteeing what is to come. Yes, the failures of human weakness and the difficulties of mortal life lead to a groaning. Ugh! Y’all laugh at me for my endless running and baseball illustrations – the things of life I like the most – and here Paul is like me (or am I like him?) giving an illustration about something of regular familiarity. Remember that Paul was, by trade, a tentmaker. Surely he thought about life, ministry, theology, big issues, etc. while he was working on tents. And what better illustration of the aging process than an aging tent. The older the tent, the more it was tattered, developing holes that needed to be repaired (surgeries! ), and the more that it simply wore out and became frail. It you’re a person of that time who was living in a tent that was getting ravaged by the elements of time, you might wish for the day you’ll be able to trade it in for a new tent. And here’s another reason for this tent illustration of the human body to be such a good metaphor: it was actually used of the incarnation of Jesus Christ. In John 1:14 it says of Jesus … The Word became flesh and made his dwelling among us. The Greek word for dwelling is of a tent / tabernacle. Christ took on our human form, our tent, to be like us in all things, yet without sin (Hebrews 2:14-18). Paul says that it is God’s plan to make us this way. And beyond that, he has put the Spirit into our lives as a deposit – a word that takes an entire phrase in English to translate the idea of a down payment with the promise of the full payment that is yet to come. Yep, Paul says, it can be frustrating, but it causes us to have to trust God in faith while looking forward to a better home with the Lord. Meanwhile, the appropriate life plan is to live our time here in productive ways that please God; that is the picture to have and the main idea to think about in our daily routines. And if that is not enough motivation, Paul reminds us that there is a court date appearance we must all face. Understand, this judgment seat is not about salvation. This is for those who know the Lord to either gain great rewards for things accomplished while living in the “human tabernacle” or to suffer an empty loss at having little accrue due to foolish camping follies in our tent life. So, how’s your tent life coming along? Do you have some holes and thin spots? It’s OK, someday you’ll be done with the camping life in living in such a temporary home. You’ve got a house just up ahead … actually, it’s a mansion. So, chin up – go do something productive for the Kingdom of God right now. I will be very honest with you. I have had times and seasons as a pastor where I have just wanted to throw it all overboard, head far out into the country with my beloved Jack Russell Terrier and simply raise chickens for a living. There is nothing quite so hurtful or frustrating as attempting to serve God and people with pure motives, yet being falsely accused of wrongful motives or of having insufficient gifts and accomplishments. Even as I write that paragraph above, I know that I have had it very easy compared to most who have set out to do this thing called pastoral ministry. That is especially true compared to the Apostle Paul. A number of years ago I was terribly discouraged, having had some opponents suggest I should just move on, quit, die … whatever … just vacate. Many things were not going well. So I spent a couple of days to go back to the roots of it all – to the New Jersey church where I met Christ as a child. I know the very spot where I sat that Wednesday evening. I found the doors of the church unlocked, with nobody around. So I went to that spot and spent some time in prayer. As we read the 4th chapter of 2 Corinthians today, though filled with great stuff, to get the big idea, simply read the first and last verses together: “since through God’s mercy we have this ministry, we do not lose heart… we fix our eyes not on what is seen, but on what is unseen, since what is seen is temporary, but what is unseen is eternal. Paul faced so much opposition and criticism, some of the worst of it emanating from Corinth. The accusations so often leveled against him were actually the bullet points on the resumes of those most loudly pointing their fingers at him. And Paul simply said that his plain teaching was a “what you see is what you get” reality of the gospel facts. Anything not plainly understood, or whatever was veiled, was that way due to the efforts of the Evil One and his pervasive cast of darkness over the world systems. Whatever light that would break through would only shine because the same God who created the world by calling light out of the darkness would do the same to cause the lost to see the gospel. The message of salvation in Christ was a great treasure. And the irony of it all was that this treasure – revealed to and preached by fallen creatures like Paul – was the most valuable thing imaginable, yet entrusted to the most fragile thing imaginable. It is kinda crazy-looking … like storing your entire fortune in a clay pot out in the backyard. But when people saw the persecutions and hindrances thrown at servants like Paul, and saw also his perseverance with the gospel message, it was a communication of great power. What should be a terrible defeat was instead an ongoing display of victory that was spreading ever more and more. So, yes, it can be nasty sometimes when serving the Lord. Even your own teammates may slap you down at times. It will never be easy-going and smooth-sailing in this turbulent sin-filled world. But that is only discouraging if your eyes are merely focused upon this world. When the larger and eternal picture is brought to bear upon the mind, it all makes sense. True values are now in sight. Losses today equal gains for eternity. Fixing our eyes on the unseen – that’s a plan; but it is a plan that needs to be mentally renewed, over and over … like … well … today! 2 Corinthians 4:1 – Therefore, since through God’s mercy we have this ministry, we do not lose heart. 2 Rather, we have renounced secret and shameful ways; we do not use deception, nor do we distort the word of God. On the contrary, by setting forth the truth plainly we commend ourselves to everyone’s conscience in the sight of God. 3 And even if our gospel is veiled, it is veiled to those who are perishing. 4 The god of this age has blinded the minds of unbelievers, so that they cannot see the light of the gospel that displays the glory of Christ, who is the image of God. 5 For what we preach is not ourselves, but Jesus Christ as Lord, and ourselves as your servants for Jesus’ sake. 6 For God, who said, “Let light shine out of darkness,” made his light shine in our hearts to give us the light of the knowledge of God’s glory displayed in the face of Christ. 13 It is written: “I believed; therefore I have spoken.”[from Ps. 116:10] Since we have that same spirit of faith, we also believe and therefore speak, 14 because we know that the one who raised the Lord Jesus from the dead will also raise us with Jesus and present us with you to himself. 15 All this is for your benefit, so that the grace that is reaching more and more people may cause thanksgiving to overflow to the glory of God. Whenever in our varied careers we have made job changes, we understand that it is characteristic to give the prospective employer some references as to the genuine nature of our abilities and experiences. It is wise for the interviewing party to check out those references by making a phone call or email contact. Letters of reference were a part of the ancient world of Bible times as well. We see Paul writing words of commendation about associates. But checking credentials was much more difficult in an era without electronic communications or even a well-defined postal system. Anyone could produce their own letters of reference from famous people far away, claiming them to be genuine. And it is not as if anyone could easily authenticate these communications. 2 Corinthians 3:1 – Are we beginning to commend ourselves again? Or do we need, like some people, letters of recommendation to you or from you? 2 You yourselves are our letter, written on our hearts, known and read by everyone. 3 You show that you are a letter from Christ, the result of our ministry, written not with ink but with the Spirit of the living God, not on tablets of stone but on tablets of human hearts. 2 Corinthians 3:4 – Such confidence we have through Christ before God. 5 Not that we are competent in ourselves to claim anything for ourselves, but our competence comes from God. 6 He has made us competent as ministers of a new covenant—not of the letter but of the Spirit; for the letter kills, but the Spirit gives life. In the previous chapter, when thinking about the complexities of the gospel ministry, Paul exclaimed, “who is sufficient for such things?” And here he answers that his sufficiency – his competence – is strong through the power of God. It is great to have outstanding credentials. Hey, I gave a HUGE chunk of my life (nine consecutive years, not counting doctoral studies after that) to the attainment of education and ministry credentialing. It’s nice, and I’m thankful for it, but academics alone are not the fuel of effective ministry. Quite a number of those with whom I went through those years did not enter ministry work, and many who did were not able to sustain it for a lifetime. It takes God’s blessing to make it happen fruitfully, and Paul had that blessing. 2 Corinthians 3:7 – Now if the ministry that brought death, which was engraved in letters on stone, came with glory, so that the Israelites could not look steadily at the face of Moses because of its glory, transitory though it was, 8 will not the ministry of the Spirit be even more glorious? 9 If the ministry that brought condemnation was glorious, how much more glorious is the ministry that brings righteousness! 10 For what was glorious has no glory now in comparison with the surpassing glory. 11 And if what was transitory came with glory, how much greater is the glory of that which lasts! Deuteronomy 34:29 – When Moses came down from Mount Sinai with the two tablets of the covenant law in his hands, he was not aware that his face was radiant because he had spoken with the Lord. 30 When Aaron and all the Israelites saw Moses, his face was radiant, and they were afraid to come near him. 31 But Moses called to them; so Aaron and all the leaders of the community came back to him, and he spoke to them. 32 Afterward all the Israelites came near him, and he gave them all the commands the Lord had given him on Mount Sinai. The law given to the people through Moses was amazing! This truth was evident by the radiance that accompanied its transmission to the people through God’s servant. Moses had to cover his face! But this great law, wonderful as it was, did not really bring life. Rather, it brought condemnation. The law revealed God’s perfection. The covenant was not able to be kept by the people – who repeatedly broke it and went into sinful directions. But God, in His grace, would promise a new covenant. 12 Therefore, since we have such a hope, we are very bold. 13 We are not like Moses, who would put a veil over his face to prevent the Israelites from seeing the end of what was passing away. 14 But their minds were made dull, for to this day the same veil remains when the old covenant is read. It has not been removed, because only in Christ is it taken away. 15 Even to this day when Moses is read, a veil covers their hearts. 16 But whenever anyone turns to the Lord, the veil is taken away. 17 Now the Lord is the Spirit, and where the Spirit of the Lord is, there is freedom. 18 And we all, who with unveiled faces contemplate[reflect] the Lord’s glory, are being transformed into his image with ever-increasing glory, which comes from the Lord, who is the Spirit. The law was transitory – fading and passing away. It was ultimately insufficient. And the Israelites who did not accept Christ were like those with a blinding veil over their eyes, something that could only be taken off by Christ. And in him, through his work on the cross, a greater glory has come. This new covenant of grace, redemption and freedom will not fade away. It grows and expands, all the way through to the eternal state. When you read this, you cannot help but be so very thankful to have had the opportunity to live at a time when all of this is in the past. We have a completed record about it. And though we don’t know all the details of what remains to get us to our ultimate destination, we have such a clear understanding as to what has foundationally made it possible. It is not fading, it is growing in brightness and intensity. There are some people who like both the smell and the taste of coffee, some who like the smell but dislike the taste, and others who totally despise both. Count me in that last category. I last had a cup of coffee in the summer of 1988 while on a missions trip to Scarborough, England. I was leading a music team that was doing beach ministry by day on the shores of the English Channel, while presenting concerts in community centers and churches in the evenings. The mayor of Scarborough heard about our presence and invited us to tea in her mansion. But it wasn’t tea, it was coffee I was served. I took a couple of sips to be polite, but at a moment when all were looking in a different direction, I surreptitiously dumped the remains into a large, potted plant (probably killed the thing later!). 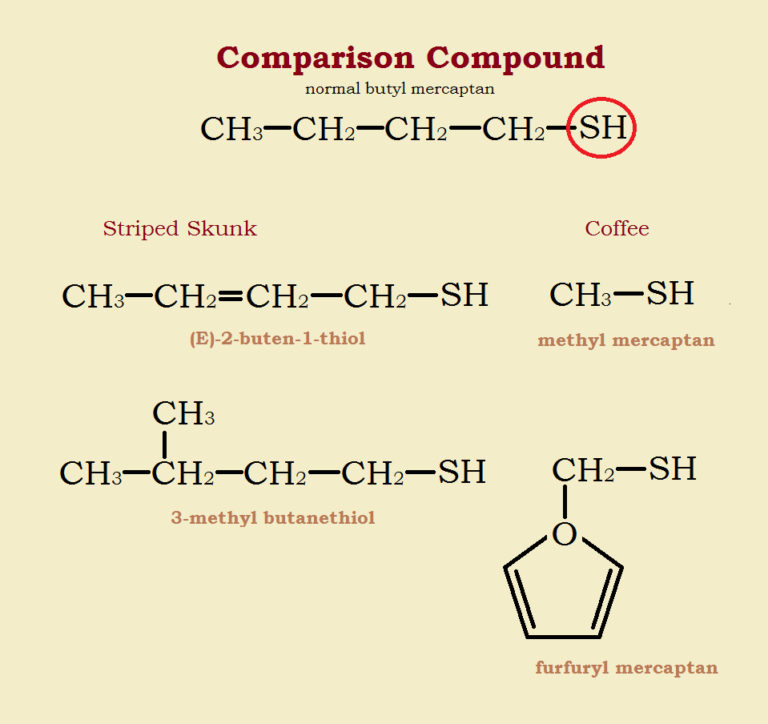 I call coffee “skunk juice.” I frequently have trouble distinguishing one odor from the other. I just know that this is not my imagination, and though I likely have a bad attitude about coffee, it TRULY does smell much like a skunk (to me). So, I did some scientific research and was quickly able to find multiple articles identifying that there are indeed overlapping chemical components, called “thiols,” in each. I have included the chemical chart as evidence. In our passage today, Paul references a well-known, historic occasion where odors in the air had decidedly different reactions from people, depending upon who you were. When the Roman legions would return home victorious from their conquests, they would march into the city in a parade that exalted the general and his troops, while also displaying the conquered prisoners. Incense was burned on this occasion and filled the air with varied aromas. For the soldiers, it was a smell of victory; but for the prisoners, it was a stench that portended their death or slavery. Paul somewhat mixes the picture by describing himself and believers as captives in Christ’s triumphal procession. But having been captives of His love and grace, we find it to be as victors with him who overcame death. The smell of Christ’s victory is the aroma also of our lives as we are identified with him. For those who know Christ or who are being called by him unto salvation through our service, this is the aroma of life. But to those who reject Jesus and the gospel, the smell for them is one that leads to death. It is a paradox of Christian life and ministry! And Paul asks, “who is equal to such a task? (He’ll answer that question later by saying that we are sufficient in Christ – 3:5). Paul further states that his ministry and that of his associates was not like that of many others with whom the Corinthians had contact – people who demanded payment for their services. Though Paul could have rightly expected this (as we covered in 1 Corinthians), he did not take anything from them. And here also, Paul says he is not like these others who peddle the word of God for profit. The Greek verb for “peddle” is only used this one time in the Bible. It was a term of derision used to describe unscrupulous street merchants who were commonly known to cheat people with their sales. In the same way that the contemporary phrase “used car salesman” frequently has a negative connotation, so did this word. Synonyms could be “huckster” or “hawker.” Paul’s ministry was not like this; it was genuine and sincere, as from God. We all smell; we all have an “odor” to those around us. We want that aroma to be sincere, as we want to come off smelling like Christ in a genuine way. This will be attractive to those who have a work of the gospel going on inside them. However, this may offend some who are hostile to the gospel, but that’s not our problem. We need to be faithful. And we need to be sure our lives are not excreting some other odor! 2 Corinthians 2:14 – But thanks be to God, who always leads us as captives in Christ’s triumphal procession and uses us to spread the aroma of the knowledge of him everywhere. 15 For we are to God the pleasing aroma of Christ among those who are being saved and those who are perishing. 16 To the one we are an aroma that brings death; to the other, an aroma that brings life. And who is equal to such a task? 17 Unlike so many, we do not peddle the word of God for profit. On the contrary, in Christ we speak before God with sincerity, as those sent from God. Imagine reading a piece of mail correspondence from one person whom you know to another group of people with whom you are also acquainted. The letter references a variety of events that are common knowledge to both, but which are largely unknown to you. Therefore, you would be somewhat confused as to how to put all the pieces together as to what had happened and relative to who had done what. This is essentially the situation we have as we continue reading here in the early portion of Paul’s second letter to the Corinthians. As we’ve referenced earlier in these devotionals, there were more than two letters from Paul to the saints in this early New Testament church. This is merely the second inspired letter that was intended to be included in the canon of Scripture. There were other letters and a number of visits being referenced at varying points. What is clear is that there were issues of sin, conflict, confrontation and discipline that had gone on within the church community, much of it involving Paul as an Apostle and authority. These conflicts caused much grief and painful relationship between Paul and the Corinthian congregation. Hard things were said (in person and in writing), and there were tears of distress, anguish and grief. What was the situation that stimulated this season of difficulty? Historically, it has been thought that it related to the individual in the first letter who had committed incestuous sin … the thought being that the congregation had treated him very severely – to the extent that though he was now repentant, they were unwilling to forgive him. However, it is now more often believed that this relates to another situation not addressed in the first letter. We might speculate that it was something targeted specifically at the Apostle Paul, perhaps wrongly questioning his apostolic authority and good intents. This offender was severely censured and in time had become repentant. Paul is saying that enough had been done to discipline this person, the apostle was forgiving him, and they should likewise do the same. The principle underlying this forgiveness and restoration of mutual love is a wonderfully timeless takeaway point to always remember. If the conflict was allowed to go on, this would play into the hand of the great enemy, Satan. It was already bad enough that this situation had erupted and caused the severity of grief all had experienced. To not forgive the person was to continue the damage and to accomplish the advance of the Evil One’s agenda … or as Paul calls this dastardly plan, “the schemes” of Satan to attempt to outwit the church family. I can tell you rather certainly that there is nothing worse in the world of doing church ministry than to have to get involved with disciplinary matters of people in sinful behaviors and attitudes. There are occasions where the behavior has blinded the person from seeing the wrongful nature of it, and they are therefore rather unapproachable – seeing the confrontation as arrogance and power-posturing of people in leadership. Often they have some measure of a following who don’t see the full picture and who are sympathetic to the offender and his viewpoints. Before long, there are factions and an overall feeling of conflict and dissention in the church family. The ministry of outreach particularly suffers, as all energies and thoughts are focused within the walls and upon the strife. By God’s grace, we as a church at TSF have been largely spared the scope of painful conflict as Paul is addressing in this passage today. But we have not (nor will we ever on this side of eternity) escaped all conflictual situations. Sometimes it is necessary, in godly love, to confront sin and error. As always, the goal to not to lord it over anyone or to “win” and bring punishment and pain upon anyone. The goal is restoration, not punitive action, as much as that may at times please the flesh in the heat of conflict. The desired outcome for all is to be like Christ in our interpersonal relationships both within the church and in front of an unbelieving world. And Paul will have some beautifully colorful pictures of this as we read on later in this chapter. 2 Corinthians 2:1 – So I made up my mind that I would not make another painful visit to you. 2 For if I grieve you, who is left to make me glad but you whom I have grieved? 3 I wrote as I did, so that when I came I would not be distressed by those who should have made me rejoice. I had confidence in all of you, that you would all share my joy. 4 For I wrote you out of great distress and anguish of heart and with many tears, not to grieve you but to let you know the depth of my love for you. 5 If anyone has caused grief, he has not so much grieved me as he has grieved all of you to some extent—not to put it too severely. 6 The punishment inflicted on him by the majority is sufficient. 7 Now instead, you ought to forgive and comfort him, so that he will not be overwhelmed by excessive sorrow. 8 I urge you, therefore, to reaffirm your love for him. 9 Another reason I wrote you was to see if you would stand the test and be obedient in everything. 10 Anyone you forgive, I also forgive. And what I have forgiven—if there was anything to forgive—I have forgiven in the sight of Christ for your sake, 11 in order that Satan might not outwit us. For we are not unaware of his schemes. As many of you know, the fourth of my five sons was married in the last year and has moved with his new wife to begin an exciting life in Colorado, even buying a new house a couple of weeks ago. My wife and I want to visit with them and see their new home and the lives they have established in that place. But so far, every attempted plan has fallen through for one reason or another. I’m pretty sure they don’t think we’re trying to avoid seeing them! Plans fall through; things happen. Paul had said he was going to come and visit the Corinthians, but it did not eventuate as he had hoped. And now there were people in the church there – likely in the category of false teachers – who were using this story as an opportunity to impugn the apostle and his motives. We live in a time of great political and philosophical division. It is the regular and daily experience to hear people in leadership vilified in awful ways. A person does not actually need to have done something terribly wrong to be effectually wounded, all he has to have happen is to be accused of the deed and a certain number of people will believe it. This was the stratagem of Paul’s opponents – they were helped as his reputation was tarnished and thrown into doubt. So Paul is on the defensive, as he will be through much of this letter. Here at the beginning he tells them essentially, “what you see is what you get, I ain’t very complicated!” He was simply serving God by speaking the truth with integrity and sincerity. There was no personal gain in it. And he hoped that over time they could become fully convinced of this. The inference of his opponents was that this fellow who spoke out of both sides of his mouth about visitation was also a person whose message could not be trusted as truthful. And to that charge Paul spoke strongly that there was no vacillation going on. This was a certain message of the gospel. The certainty of the gospel is illustrated in three truths about the believer’s relationship with God through Jesus Christ. First, there is an anointing of the Holy Spirit at the moment of salvation. The picture looks back to the anointing of priests at the time of their induction into ministry. Secondly is the seal of ownership. In ancient times, a seal on a document specified the owner of it and granted that document its authority and veracity. Thirdly is the deposit of the Holy Spirit. This banking/financial term spoke of a down payment that affirmed the necessity of full and final payment to come. These are three awesome pictures that give us confidence in a broken and messed-up world. We possess stuff that is so much greater and more lasting than the vicissitudes of this material age. 2 Corinthians 1:12 – Now this is our boast: Our conscience testifies that we have conducted ourselves in the world, and especially in our relations with you, with integrity and godly sincerity. We have done so, relying not on worldly wisdom but on God’s grace. 13 For we do not write you anything you cannot read or understand. And I hope that, 14 as you have understood us in part, you will come to understand fully that you can boast of us just as we will boast of you in the day of the Lord Jesus. 18 But as surely as God is faithful, our message to you is not “Yes” and “No.” 19 For the Son of God, Jesus Christ, who was preached among you by us—by me and Silas and Timothy—was not “Yes” and “No,” but in him it has always been “Yes.” 20 For no matter how many promises God has made, they are “Yes” in Christ. And so through him the “Amen” is spoken by us to the glory of God. 21 Now it is God who makes both us and you stand firm in Christ. He anointed us, 22 set his seal of ownership on us, and put his Spirit in our hearts as a deposit, guaranteeing what is to come. When you are about to go through something very difficult like, say, a complicated surgical procedure, who do find most helpful and comforting in conversation? Is it the 20-something with stellar health and a beach body, or is it someone who has successfully survived and recovered from your same affliction? Of course, it is the latter. And why? Because they know internally and experientially what you are facing. Their reflections make them extra sympathetic and insightful. You feel from them that they know and feel your pain, your fears, etc. And having survived it and recovered from it, they are able to give you comfort and hope. As Paul begins his second (inspired, canonical) letter to the Corinthians, he jumps rather quickly into some of the main ideas that he will expand upon throughout. Few people in church history could ever put together such an extensive list of trials and difficulties as could the Apostle Paul. In this opening greeting, he references some non-specific afflictions that brought him and the others suffering with him to a state of hopelessness. It looked like all was lost. Death appeared to be the only escape. So what was this experience in Asia that he references just generally? The commentaries all offer five or more plausible possibilities. And that makes my point. Paul had no shortage of difficult experiences of suffering. Some were personal health struggles, some were with opposition from civil authorities, while other conflicts occurred with false teachers inside the church. But these experiences, though unpleasant for sure, had purpose in the mind and plan of God. The sufferings made Paul and his co-sufferers dependent upon God, because there was no other resource. These difficulties were marks of their fellowship with Christ in his sufferings … yes, this is par for the course for the Christian. Such painful experiences and comforting deliverances made it possible for Paul to comfort others in their pain. Cumulative experiences of suffering and deliverance give the believer a new level of overarching confidence and hope in future deliverance and in final salvation by a faithful God and Father. The role of the Christian is to trust God and be faithful to stand in prayer for one another as we all battle the difficulties of life in a fallen world. And in line with that last point, for those of you reading this devotional on the date of its publication – March 13th – would you pray today for one of my very close college friends and baseball teammates, a guy named Dave. He has been battling pancreatic cancer and has successfully advanced to a point of a surgery to remove a tumor. It is a very delicate and complicated surgery of 10-12 hours duration, though he might not be able to survive it. His faith is incredibly strong and he is very upbeat about it. But the whole thing is very intense for his family as well. Thank you everyone! 2 Corinthians 1:1 – Paul, an apostle of Christ Jesus by the will of God, and Timothy our brother, To the church of God in Corinth, together with all his holy people throughout Achaia: 2 Grace and peace to you from God our Father and the Lord Jesus Christ.